At CFE, we believe in teaching proper from, practicing it and learning about injury-prevention from the start. All new members graduate to group classes after they have completed our Fundamentals program. You can be at any level of fitness to start classes. The purpose of our Fundamentals course is to teach you the movements that you will use in our group classes. We also teach you how to scale each movement for your personal level today and how to adapt as your fitness level grows. Fill in the form to the right, call, or stop by the gym to book a complimentary consultation with a coach. During this hour, we will explain our program and how it will get you—and keep you—more fit than you ever could have imagined. We will also work with you through a short fitness assessment to determine your current strengths and limitations and how we can help you achieve your fitness goals. Experienced CrossFitters who can demonstrate adequate form in the basic movements may choose to jump right into group classes after testing out. This is where your coach for life comes in and saves the day! You’ll meet your coach during your assessment and your coach for life will work with you to understand exactly what motivates you and how you can work together to ensure you keep coming back and continue to progress and achieve your goals. If you fall off track expect a call from your coach asking where you’ve been and encouraging you to get back in the gym. Simply starting and falling off track then never coming back just doesn’t happen at CFE. We are 100% committed to your success and your well being! After your fitness assessment, you will begin one-on-one personal training sessions with your coach. During these sessions, you will learn the movements used in group classes, proper warm-ups, mobility and recovery. We will also talk about nutrition, and will work with you to discover the best fuel for your individual needs. 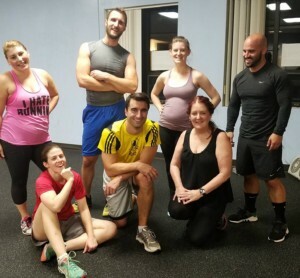 After your personal training sessions, you will be ready to graduate to group classes. Our Fundamentals course generally takes between 4-10 sessions. You may be faster or you may take a little longer. The important thing is that you meet all of the benchmarks and are ready to safely move to group classes. Once you graduate, you are ready to begin group classes! The social environment will give you a different kind of push and it will help you reach new physical and emotional levels you didn’t think were possible. You will also find yourself with a new social and support network who will help you on your continued path to greater health and happiness. You’ve probably already made a bunch of gym friends by now! You and your coach for life will decide how many times per week you should attend group classes and how often you should both meet 1-on-1 to stay on track. This is a hybrid membership. It’s specifically designed to keep you attending classes and ensure you meet with your coach for life as often as needed. No more starting a program and never finishing it, we make sure you’re in the gym as often as you need to be!